At the end of April, on a bright spring day, the Trout in the Classroom graduates of 2014 finally got the sending off they deserved. 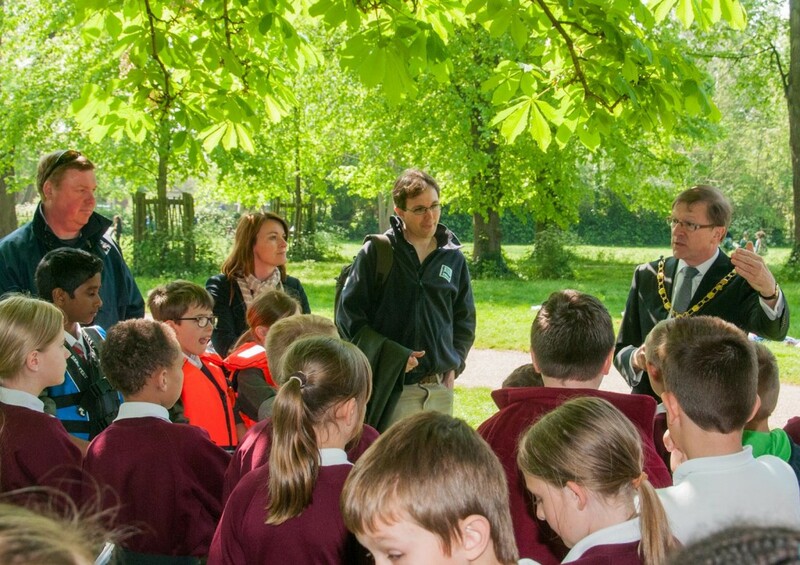 Five south London schools along with the Deputy Mayor of Merton (Councillor John Sargeant) and Wandle Trust staff and volunteers were there to mark the event. The Deputy Mayor began proceedings with a perspective on just how far the river has come since he was a boy growing up in the area. 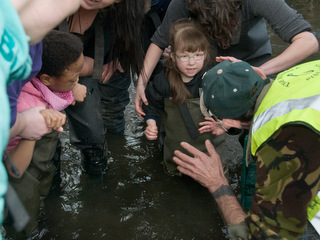 He then gamely obliged us by stepping into a pair of waders and lowering himself into the river to help the children with the release. There was no shortage of excitement on display. For the children, the day was the culmination of a fascinating journey of discovery into the life a native fish species – from egg to alevin to fry – literally opening up a whole new world. As an adult watching the event, it strikes you how tangible the exhilaration of the children is – something that is perhaps no longer that familiar to us. It extended to secondary level – if in a more controlled fashion! 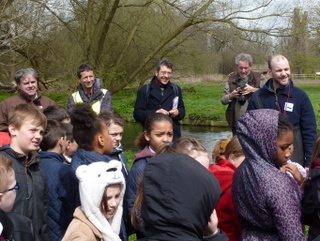 – as students from Francis Barber PRU and Sutton Grammar also were clearly pleased to be in the river and part of the event. 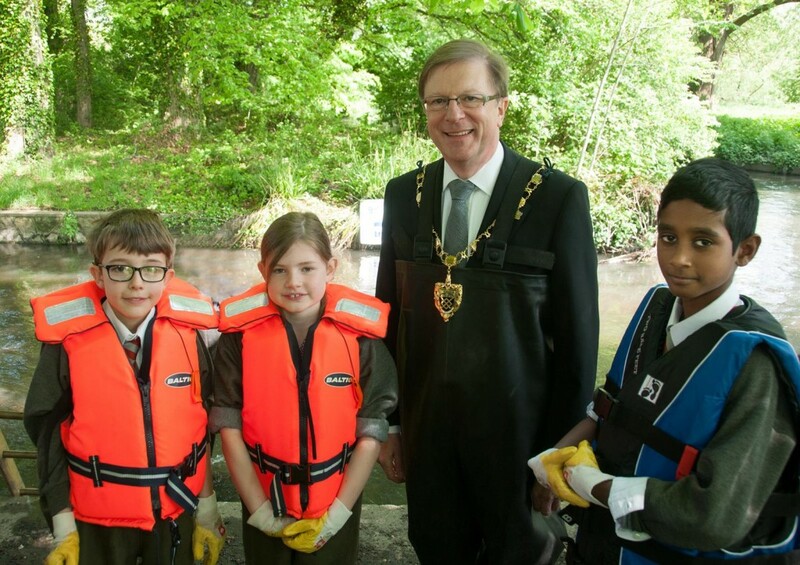 I was particularly interested in the reaction of students from Culvers House primary school, some of whom spent their time enthusiastically picking up litter and pointing out rubbish on the river bed. Although wishing to oblige them, by the time those in the water got around to looking for the rubbish, too much silt had been kicked up for it to be seen, to the disappointment of the children. Their enthusiasm nonetheless impressed me, and it struck me how much their optimism and belief in their ability to make a difference is such a precious commodity that young people are uniquely gifted with, and is something that we should be doing our very best to protect and cultivate. It is a crucial part of changing things for the better. 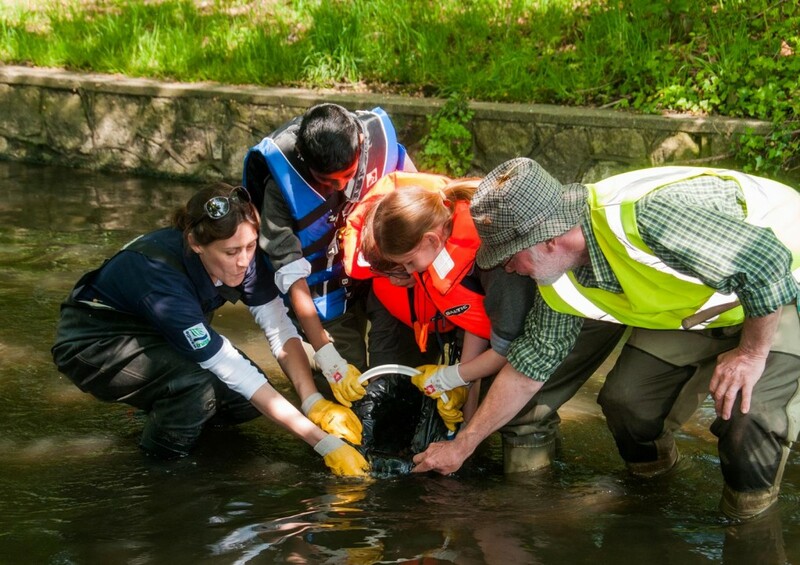 And with its story of successfully reintroducing a breeding population of brown trout into a once heavily polluted and industrial environment, Trout in the Classroom once again demonstrated how it can play such an important role in keeping that optimism alive. Anyone familiar with TitC will notice that the release was a little later than usual. Normally timed to occur before the Easter holidays, the release day this year had to be postponed by a month on account of a significant pollution spill in the river. Following the heavy rains over the winter, large amounts of water entered the works as a consequence of the high water table and mixed with the untreated sewage. This overwhelmed the treatment plant storage capacity and Thames Water were obliged to discharge the raw sewage directly into the River Wandle. Although no fish kills were reported, oxygen levels were severely depleted. Even since the release, further pollution incidents have occurred. 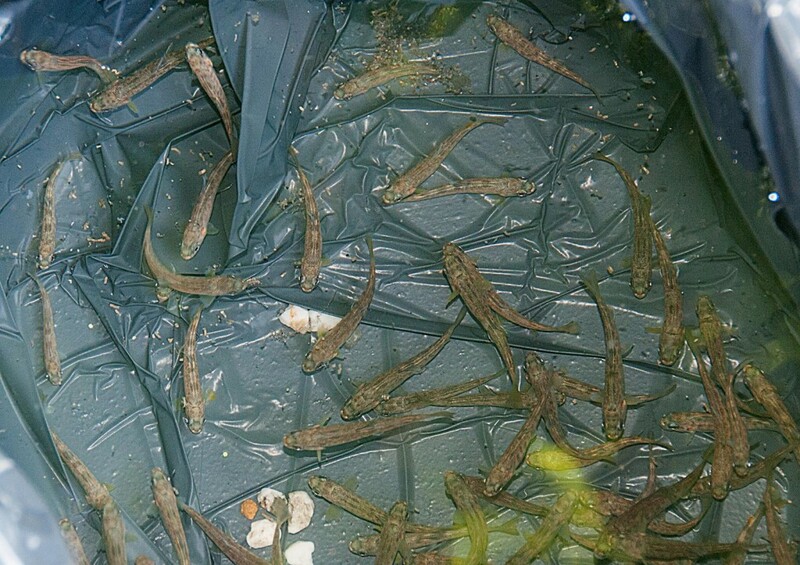 The connection to Trout in the Classroom is appropriate as it serves as a reminder how the Wandle is still a river with an uncertain future facing significant man-made threats. This is why education projects like TitC have a vital role in helping local people feel invested in the health of the river and the species that depend upon it, and can teach them to be alert to any deterioration in its condition. In turn, this could help build the consensus for the authorities and water companies to make the investments required to eliminate these threats. This entry was posted in Uncategorized and tagged Events, Fish, People, Pollution, Trout in the Classroom, Wandle on May 16, 2014 by AJ. Phew! 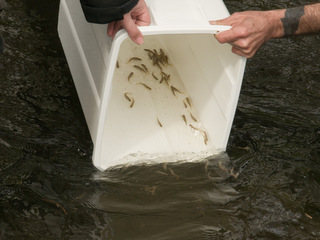 The first of our two scheduled Trout in the Classroom release days has come and gone successfully, and around 300 young brown trout have been set free into the waters of the Wandle. 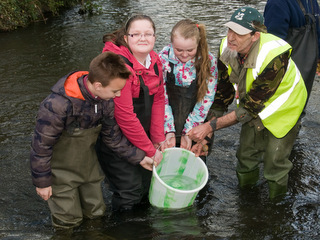 On Thursday 28 March, students and staff from 5 schools in the Wandsworth area brought their very lovingly nurtured brown trout in buckets from their schools to the banks of the Wandle on Garratt Lane and cheered them on as they were released into their new home. The buzz began as around 70 students, staff and volunteers arrived early, and waited in suspense for the Mayor of Wandsworth, Cllr Adrian Knowles. Thankfully, he did arrive – and delivered a thoughtful speech about the significance of the event, putting into perspective the journey the river has made in the past 50 years. I have to admit that at times it has been a rocky road to get the fish to this point. The schools had to contend with fungus infecting the initial batch of eggs, killing many of them before they hatched. Of the new recruits, added to the tanks as alevin, there have been fish kills from high levels of nitrite and occasional equipment malfunction. Therefore, it was with a certain degree of pride that, collectively, we had these 300 or so fish that had overcome these barriers to make it to the river! It was very gratifying to see the number of volunteers turn up for the event. The volunteers have made the project possible, by providing countless hours of free assistance to set up the equipment and troubleshoot to keep the tanks going. I would like to thank them very sincerely for their effort – it was a real pleasure to have them on board. 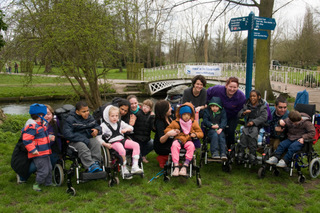 The most gratifying part, however, was the sheer excitement and pride shown by the young people. The value of the project became apparent as we helped a group of them get into waders and assisted them into the river, for many of them for the first time. It felt like – and I’m convinced it was – an important event for these young people, bringing them closer than ever to their local natural environment. Which, of course, is what it is all about! 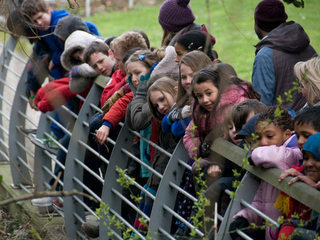 Later this month we will be writing about the support from local businesses that made this project possible, but we would like to single out the Western Riverside Environmental Fund – a partnership between the Western Riverside Waste Authority based at the mouth of the Wandle and Groundwork UK – who have majority funded the scheme for 10 schools in the Wandsworth area over the past 2 years. 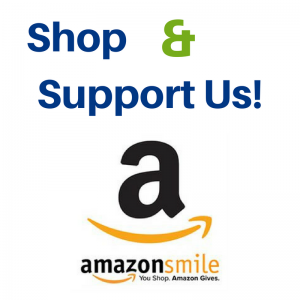 We are very grateful for this support and would like to thank them once again. Update 1: The story of our release day was picked up by the local media: click here to watch a video on the Wandsworth Guardian’s website. 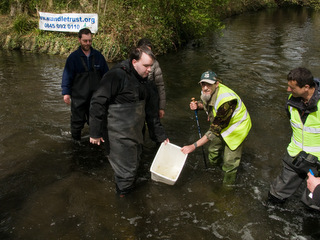 Update 2 : Environmental writer George Monbiot attended our second trout fry release, in Morden Hall Park, on Thursday 18 April, and has now reported it here in his blog on the Guardian website. This entry was posted in Uncategorized and tagged Education, Events, People, Trout in the Classroom, Wandle on April 10, 2013 by AJ.